How much would you be willing to pay for a Transcale string set? Like so many users around here, I was a bit disappointed to not be able to find double ball strings for the Synapse Transcale model. Sure, this guitar can use regular strings, but that's not the point. Using double ball strings is the way to take advantage of the better tuning and stability that the Synapse Transcale offers. So I've contacted a few string manufacturers, and a couple of them (both European; one in the UK, the other in Germany) replied back and are now sending me some sample sets for testing. As soon as I get them, I will make a small video review of them, just to see if they fit properly, how well they handle tunning, etc. For now, if you are a user of a Transcale model and if you are indeed interested in getting some of these sets of strings, please answer the poll I've created with this topic. Regarding pricing, well, it depends on how large your order is, but as these are small factories making small production runs specifically for this instrument, I guess we should expect to pay a bit more than what the usual market price was. But if a good number of us reply to this poll and show some interest, maybe it can help bring prices down a bit. And we'll all be happy! 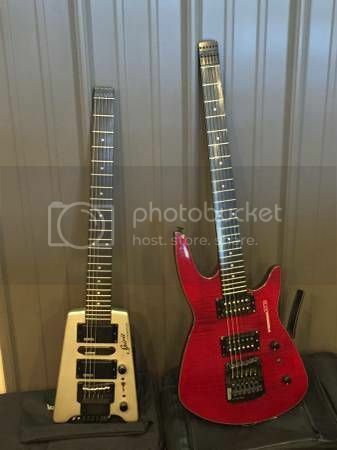 My son is interested in a Trans Trem & I know where to buy a used ZT3, I am newbie to this style of trem but have setup most every style of guitar ever made.. I remember when the Floyd Rose came out if that tells you anything.. Thinking hard about buying him this guitar but it will be a couple weeks after Christmas before I can afford it..
Lovely guitar the ZT3. Your son is a lucky guy! But I think you're confusing the TransTrem with the Transcale guitar. You can still get calibrated TransTrem strings around at retail. No need for special manufacture orders like this. This post is about double ball strings *specifically* for the Transcale guitar, which has a longer scale than most guitars (which is why it's damn difficult to find strings at the moment). They are more a baritone double ball string.. Which I know I can.. It'll be several months till I can do what I need to do..
Did you ever test out the string sets or make the video? I'd be into the baritone version for sure. I suspect that they're discontinued as they aren't available anywhere anymore. Alternately where does one go to have custom string sets made? Looks like it is still possible to find the transcale double-ball strings. Here on Amazon for sure and my local store (here in Geneva). But I really like the idea of having more/better choice in the supply. Regarding the double ball strings for the Transcale, yes, they're almost impossible to find at this moment. I've contacted a factory in Germany called Pyramid Strings and ask them to produce them. After a few tries back and forth, they've finally managed to do the same size/length (apparently it's not such an easy thing to produce...), and their prices are even cheaper than most commercially double ball strings (D'Addario, GHS, etc.). My advise is to download Pyramid's catalogue from their website ( http://pyramid-saiten.de/de/direct/ ), choose your preferred gauge and reference, and then contact them directly and ask them to produce them for you. Mention that you got his contact from André Toscano, the "Portuguese guy with the Transcale guitar". He'll probably remember me. As for the difficulty in finding Steinbergers in the market, welcome to the club! Gibson doesn't seem very interested in producing many Steinbergers for some unknown reason. It's one of those "sattelite brands" that they purchase every now and then because they can, and then either keep releasing products just every once in a while, or they just bury them completely. A rep from Gibson support told me they're only scheduled to be produced twice every year. When they show up in the market, they quickly vanish. The end of December batch, for example, was depleted in about a week. So if you think you can still get your hands on a new Synapse, go for it and don't be picky about the color! The Synapses are good guitars. And they have that mixture of wood with the carbon/graphite U channel in their necks, which is one of the reasons that draws players. They are very stable guitars, very rigid and fast necks, and don't detune easily. (except for the low cost Spirit line, which has the Synapse look, but a regular wood neck). Ned Steinberger has sold the brand to Gibson for a number of years now. But word on the street is that a new guitar from his new company ( Ned Steinberger ) will show up this year, so fingers crossed. It's an amazing guitar brand, their products are great, the earlier guitars from the 80's and 90's (the GL, GR and GM series guitars) are sold today for prices that in most cases are double that of a new Les Paul. Just check eBay if you're curious. I have an older GR4 Steinberger and it's amazing. It has a completely graphite-fiber neck (no wood at all) and it's amazingly rigid and ergonomic (it doesn't even need a truss rod, as graphite is stiffer than metal). See you on the FB group. Thanks for your quick response and your knowledgeable insights! I have joined the FB group and will definitely follow it closely. And thanks for the contacts for the Transcale string manufacturer. I realized that I put the wrong URL in my previous message. I found some transcale strings on Amazon (Music Zoo) here. However, they will not ship directly to Europe . I totally agree with your comments; I have been considering buying a Steinberger for a while - just wished I had done so a lot sooner! Right now, I am still hesitating between the Transcale and the standard SS-2F models. Love the piezo and handy capo, but the difficulty in finding the longer double-ball strings and the added length of the Transcale were making me lean towards the standard models. It's a really tough choice. Yes, the Steinberger FB group will be your first stop for any questions you have. There's some really knowledgeable and friendly people there, and you'll learn a lot about the brand (and headless guitars in general) if you want to. I was in your shoes about seven months ago when I got my Transcale. Also had the option of choosing the regular scale Synapse, as it was available at the time. Ended up getting the Transcale because I wanted something different. The longer scale allows me to use 0.011 - 0.052 strings like they were .010 - 0.046, because as the gauge gets bigger and the scale gets longer, the string tension remains more or less constant. So you have the benefits of beefier strings without the extra "finger work". Also, I don't use the piezo much, but on occasion, a mere 20% piezo mixed in with the magnetic pickups is just what's needed to give your sound a different personality. So I guess it's nice that it's there readily available, even if I don't use it. And I've been finding out that, even using single ball strings (which is what I'm using now), the tuning stability doesn't suffer much (or at all). So if I had the same choice again, I'd go for the Transcale again. Especially having other regular scale guitars at home. And believe me, single ball strings will work just fine too, and you'll have more choice and better pricing. For those who might be looking - Samash has some baritone strings. As for my strings history on this guitar. I played the stock ones, ultralight. Didn't like it. Sound too wobbly. Went for baritone - LOVED the sound. If anyone's interested - here's the Nick Drake cover done on these strings. Just listen to this deep sound. It's all clean straight into soundcard without eq or compressor or anything like that. Straight barebones as can be line in recording through piezo. recently, several weeks ago I switched for standards. Because Steinberger apparently cannot hold baritones too well. Stabely, each half a year the neck just bent horribly. And even the bridge lowered to maximum couldn't help the issue. Awesome for playing rhythm guitar but solo? forget about it. Bends? forget about it... unless you have some monster strong fingers - then go for it, by all means. A remarkable instrument. I love it so much - I haven't yet a desire to purchase another electric guitar yet... well, maybe ZT-3 due to Transtrem but it's really beyond my budget right now. It amazes me that the guitars are so unpopular and difficult to find. They are the future, in my opinion. Make a transcale guitar with piezo - it will be the holy grail for me. This is a 2018 update. - I contacted Max at Pyramid Strings (Pyramid@Junger.de). - I gave him the Steinberger specs for the strings: http://audiolog.pt/s...ale_strings.pdf and selected the Transcale Standard strings (see below for the three different types*). - Current rate is 11.06 Euros plus shipping. They do ship to the US too. Around six weeks turnaround time. Thanks André for your 2015 research! Three years later it is still good!